This shop is located in one of Kyoto’s shopping arcades, just five minutes on foot from the Shijo-Karasuma intersection. Its signature dish is the Tori Paitan Soba. Tori Paitan is a milky and thick broth made from pulverized chicken bones stewed over high heat. The Mitsuru ramen features Tori Paitan broth with fresh Kyoto pot herbs in a rich liquid. The shop is bright, clean, and inviting. It is open until 2;30 AM on weekdays, making it a good potential stop after a night of drinking. This ramen features a stock made from chicken bones and pot herbs. It is thick, viscous, and delicious. Choose from the Shiro (salt flavored) or the Kuro (pepper flavored). We recommend the Shiro, as it brings out the flavor of the chicken. 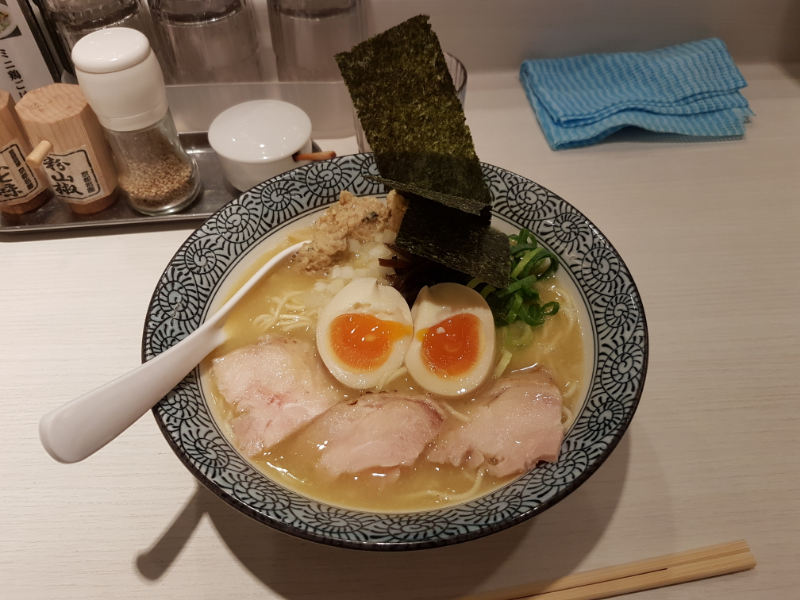 Fresh egg from the Tamba region in Kyoto, a famed producer of eggs, is mixed with roasted pork filet chunks and a heaping helping of scallions. Mix well and enjoy. Tori Paitan broth with bonito flakes and dashi stock. This dish has the simple taste of bonito. If you prefer a leaner and less thick soup, this is for you. After eating about half of your meal, try experimenting with the nearby condiments. They enhance the flavor of the broth and are recommended. Everyone is spicy, so use just a bit. *From left, homemade spice, kuro-shichimi, and peppercorns. First buy a coupon at the vending machine inside the shop. 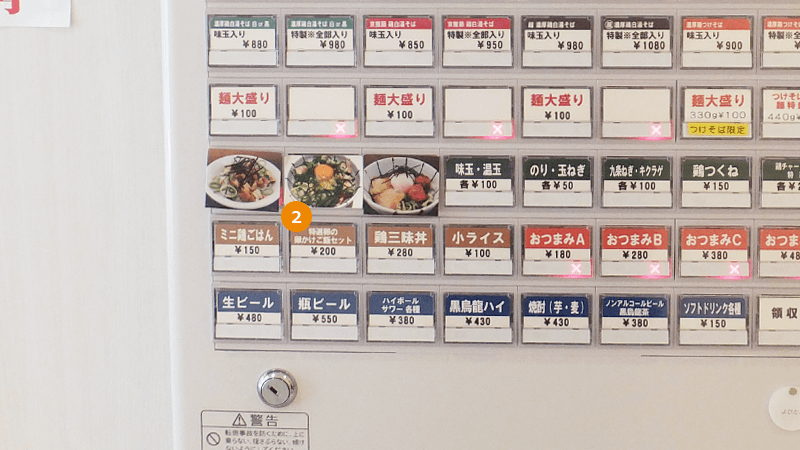 Select the ramen of your choice and push the corresponding button. Once finished, push the "おつり・返却" (change) lever to receive your change and a ticket. Enter the shop and hand the staff your ticket to complete your order. 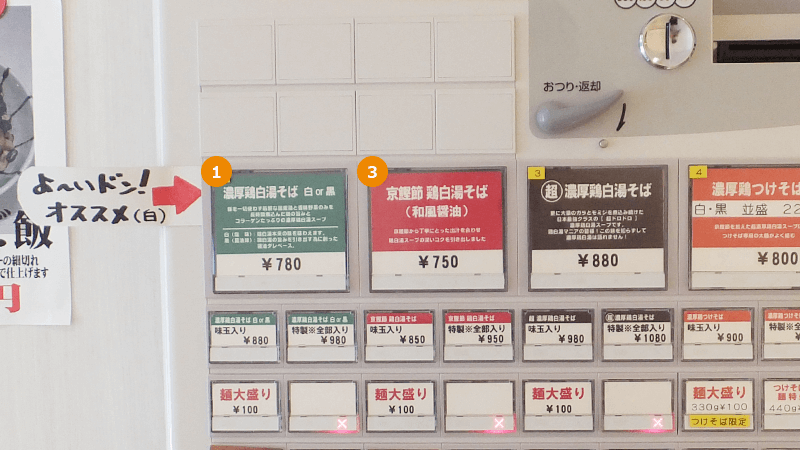 To order more noodles, you must press the "麺大盛り" (extra noodles) button and buy another ticket. Female diners will probably be satiated with the normal size, while men may want to super size. The rich ramen here is simply addictive. If you haven’t tried Tori Paitan before, you must have it at least once. 5-minute walk from Hankyu Karasuma Station. Tends to get crowded between noon and 1:00 PM; you may have to wait about 10 minutes.